How does technology influence the distribution of new social and political ideas? Using a natural experiment from Swedish history, new research from the University of Warwick explores this question by evaluating the impact of rail travel on the spread of social movements. In Sweden, social movements such as unions, leftist parties, temperance movements and non-state churches were important forces for democratisation. The ability of individuals to travel and spread their ideas was a key driver for the spatial diffusion of movement membership. Identifying the importance of technology for the historical spread of democratic ideas can sharpen our understanding of contemporary events, such as the Arab Spring. 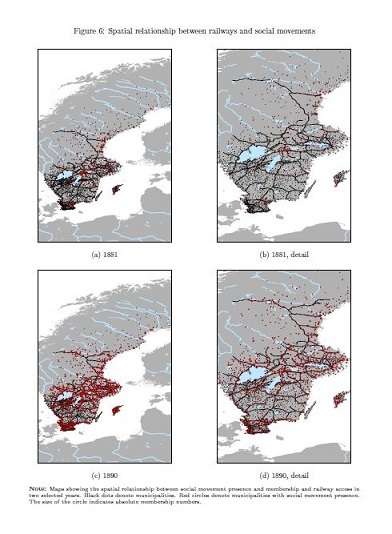 The role of rail transport in driving economic change is now widely recognised – but its role in enabling the spread of grass-roots social and political activism is equally significant, according to new research from University of Warwick economics researcher Eric Melander which uses Sweden as a case study to investigate how technology influences the spread of political ideas. In nineteenth-century Sweden, as in much of Europe, trade unions, leftist parties, temperance movements and non-state churches were important drivers of democratisation and social reform. By 1910, 700,000 Swedes were members of at least one such group, from a total population of around 5.5 million. At the same time, the Swedish rail network had been developed from just 6,000km in 1881 to 14,000 in 1910. Analysing a rich data set including railway maps, information on passenger and freight traffic, census data and information on the membership of social reform movements in Sweden, Melander demonstrates the impact of railway access on the spread and growth of activist organisations. Well-connected towns and cities were more likely to host at least one social movement organisation, and to see more rapid growth in membership numbers. Commenting on his findings, Melander said: “Using a natural experiment from Swedish history, I show that railways play an important role in the spread of the ideas embodied in these fledgling social movements. The positive impact of rail was seen only as a result of increased passenger flows to a town or city – freight services had no impact, suggesting that it is the mobility of individuals which spreads new ideas, not economic activity more broadly. Eric Melander added: “These findings are important because they shed light on the role played by railways in particular, and of communication technology more broadly, in the diffusion of ideas. The paper, Mobility and Mobilisation: Railways and the Spread of Social Movements, is available HERE.